Certain commercial and residential applications require liquid products in industrial-grade containers, such as drums or intermediate bulk containers (IBCs). To obtain accurate weight filling without overflow, underfilling or contamination, PACK’R provides semi-automatic and automatic IBC-filling and drum-filling equipment. PACK’R provides liquid-filling and capping equipment to companies in the chemical, petrochemical, agrochemical, food, vegetable oil, and paints and coatings industries. 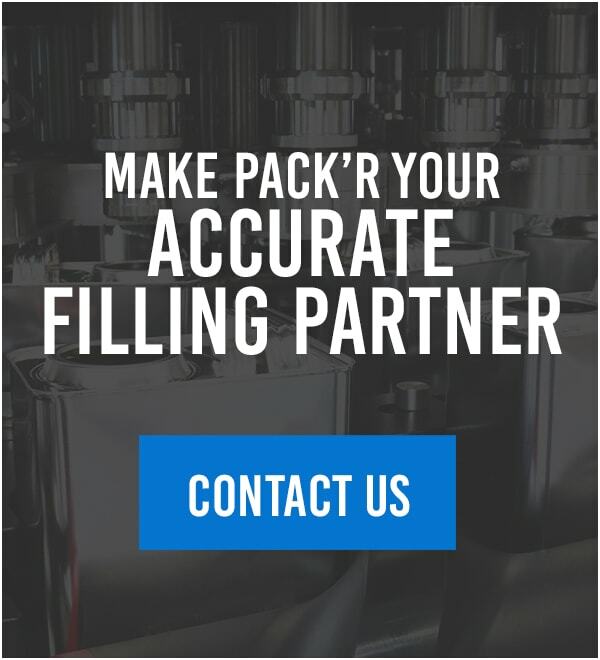 When you need accurate filling machines to place liquid products into the appropriate containers, PACK’R has the equipment solutions that will deliver productivity and scalability to your processes. If you are looking for efficient machine processes for your production line, PACK’R provides automatic and customized liquid-filling machine solutions. Automatic drum-by-drum filler machines can fill an average of 120 drums per hour, so you can get containers lined up for shipping individually. This production arrangement is ideal for companies that will be shipping various amounts of liquids to multiple destinations during one trip. Our semi-automatic and automatic IBC-filling and drum-filler machines are for pallet operations. These machines can fill drums and IBCs on pallets so that the containers can then be capped, and the pallets lifted onto the delivery trucks using forklifts. You can load pallets onto trailer beds and trucks quickly to meet various shipping deadlines. Your liquid manufacturing process may need a solution where you want the finished machine shipped directly to the floor for immediate use. Other times, you may be introducing a new product and require customized engineering designs to determine the right component configuration, materials and equipment operation to suit the characteristics of the liquid and the container-filling capacities. Here at PACK’R, we can provide you with both solutions under one roof to better accommodate your manufacturing goals. In addition, we offer service and support for our drum- and IBC-filling machines. Whether you are looking for operator training for a new machine, basic equipment maintenance, or require upgrades or retrofits due to product changes or operational growth, we’ve got you covered. Ensure you are accurately filling your drums and containers with your liquid products by speaking with our representatives today to discuss our equipment. We can provide you with the machines that will integrate into your existing production lines to make your processes more efficient.